Ranking The Best Electronic Shelf Label Solution Providers. One IoT case that fascinates me is the smart retail sector specifically, Electronic Shelf Labels.The solution replaces traditional paper price tags with connected digital price tags. Store owners can change prices instantaneously opening up a myriad of opportunities ultimately increasing store efficiency, enhancing the customer experience, optimizing inventory, and boosting revenue. Thousands of connected nodes, bi-directional communication, extremely low battery-consumption, speedy transmission to the cloud – this case oozes with great IoT flavors and it is not just a concept, it is live NOW in stores worldwide. I will rank the current ESL vendors based on their over hardware solution, wireless connectivity solution, and demonstrations provided at the NRF Big Show and EuroCIS: two of the biggest retail shows. Every main ESL player had a booth and as a die-hard geek, I took the time to do an in-depth evaluation of each. Worth noting: I learned the E-paper displays were all identical as there is only one worldwide vendor of the technology – E Ink. What really actually makes the ESL solution work is the wireless connectivity solution and hardware simplicity. Here is my ranking of the best Electronic Shelf Label Companies focusing on retail. M²Communication is as they said “the new kids on the block” but there is a reason this new player has emerged with significant traction. This company is comprised of radio frequency chip-set makers. As mentioned, the wireless communication aspect of ESL is actually what makes the whole solution “work”. They developed their own sub GHz wireless communication protocol from scratch and it can do A LOT more than just ESL (I took at look at their whitepaper). The salesmen at their booths are clearly engineers wearing suit and ties which was quite a refreshment from the car salesmen at all the other booths. They were very honest and transparent in their business status. The big selling point – their demo. All the other booths had some pretty awful demos. M²Communication‘s actually worked. They had about 100 price tags on display on a wall. They allowed me to use their web based interface to change all prices to my satisfaction. They probably regretted letting me take the reigns because I spent about 30 minutes on their laptop not only changing prices but changing images and small product details. To my delight a couple seconds after I pressed the “update” button, all the tags began flashing one by one showing the new price and content. True two-way communication as each of the tags relayed the battery life and signal strength back to the computer. HUGE differentiation – hardware simplicity. Their solution is plug and play. Their access point, responsible for communication from the store’s system to the tags is the size of a computer mouse. No professional installment required. Definitely the most technically sound solution in the market right now. Let’s just see how strong their sales and marketing team is as they try to push this pass the giants. It took me a few tries to get to the booth’s “technical guy”. Their communication is also like M²Communication‘s: a sub GHz proprietary protocol. They did not design it themselves; they actually outsourced that work to another company who they did not wish to disclose. This company seems to have a lot of man power and are touting some impressive deployments in the supermarket industry. Good things coming for this company. SES is the oldest largest ESL vendor. Their original wireless communication solution uses SUPER DUPER low RF frequency: 36KHz! The transmit speed is SUPER DUPER slow. This is the same technology used by submarines to communicate in the depths of our oceans. To support this frequency you need a long antennae. By long I mean 1km long. Some SES installments wrap a 1KM long antennae around and around in their customer’s ceiling. Their communication is only one way. And the crazier thing is…they are currently the market leader. This is only because they got a head start in this market. They started in 1992. They recently acquired Imagotag which is another way of saying “our solution is completely out dated”. Imagotag instantly gets bumped down for using the 2.4GHz frequency as a solution. They say they use channels unoccupied by Wi-Fi and bluetooth. I believe they said they are using channels 2,3,4,6 in the 2.4GHz. But we all know that Wi-Fi is not strictly bound to those channels. There is going to be significant interference in my opinion and range from a physics point of view is not going to be as good as a sub-GHz solution. Pricer uses infrared technology to communicate to their tags. They have a tricky installment in the ceiling of their deployments. The hardware looks hideous and quite distracting if the retailer’s ceiling is low. The infrared communication is not reliable.If a customer happens to be standing in front of the tag during the update – then it will not be successful. The good thing about their solution is that update speed should be quite fast. Range in a setting that is completed unoccupied with all the lights off should be pretty good. A huge problem is the security of infrared. It can be easily hacked as demonstrated by by viral video on youtube which shows how you can use a Game-boy to change the prices on an infrared ESL. Yikes. Industrial ESL provide the reliability and visual instruction inherent with paper labels along with automated tracking. The key to adoption in the Industrial space is working with existing wireless infrastructure. Ubiik has managed to make ESL compatible with all off-the-shelf UHF RFID readers. The high adoption rate of this product in factories all over Asia places Ubiik at the forefront of ESL for the industrial sector. Ubiik also has E-Paper that can be updated via NFC (android smartphones or any off-the-shelf NFC reader). And SUPER long range ePaper with over 1km update range. 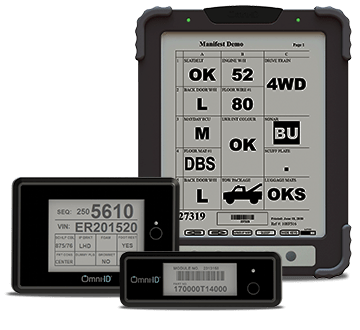 In 2012, Omni-ID launched ProVIEW — the world’s first visual tagging system — to replace paper-driven processes in manufacturing, providing not only the ability to track assets; but dynamic, readable instructions right on the tag, completely changing the auto-identification industry landscape. The ProView markets itself as RFID compatible E-Paper but after taking a deep dive, we realised that OMNI ID actually uses a proprietary protocol to transmit to the ProView tag. Therefore, factories will need to install Omni ID’s proprietary hardware/base station to update the displays much like the ESL in the retail space. Mpicosys offers a variety of customised E-Paper signage. MpicoSys has developed the PicoSign displays and enables special devices, in fact answering any requirement and questions one can have on the use of ePaper displays. One of the best examples is the PicoSign Wall at United Nations headquarters in New York. This entry was posted in BLE, business, digital price tags, electronic shelf labels, internet of things, retail, rf tags, smart retail, startup, technology and tagged best digital price tags, digital price tags, display data, electronic shelf labels, ESL, imagotag, iot, lg innotek, m2communication, pricer, retail, rf tags, samsung, semco, ses, smart retail. Bookmark the permalink.